Adult orthodontics simply means orthodontics for adults, as opposed to childhood orthodontics. Some people may have always been dissatisfied with their teeth but were unable to have them corrected during childhood. There are also instances where orthodontics may not actually be needed until later in life. The word “orthodontics” is composed of the prefix “ortho-” meaning straight, and the Greek “odont” meaning tooth. 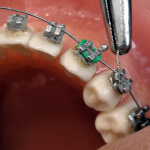 More technically, orthodontics is the dental speciality which concentrates on the growth of the teeth, jaws, and face. Patients may seek treatment to improve their bite, or for cosmetic reasons. Any dentist is allowed to perform standard orthodontic procedures. Complex cases might require a specialist orthodontist, a dentist with additional post-graduate training in orthodontics. The most common orthodontic appliances are fixed braces, which are worn permanently in the mouth until the teeth are aligned. Conventional braces are visible on the surface of the teeth, but modern tooth-coloured ceramic braces are hardly visible. Patients who fear feeling self-conscious while wearing a brace as an adult may get the option of lingual braces, which are worn behind rather than in front of the teeth and are therefore virtually invisible. Removable braces and aligners are used to deal with straightforward issues. The vast majority of patients will have to use retainers after their brace has been removed. Retainers are essential to prevent the teeth returning to their previous position. Retainers may be permanent or removable; virtually invisible permanent options are available. You will be given several options and full instructions by your dentist. What Conditions are Treated with Orthodontics? According to the British Orthodontic Society, the most common problem treated with orthodontistry is protrusion of the upper front teeth, or so-called “buck teeth.” This is increasingly addressed in childhood by wearing braces. Other issues commonly treated with orthodontics include underbite, crowded teeth, and asymmetric teeth. Teeth may become crowded or asymmetric in adulthood due to tooth loss, teeth moving around due to gum disease, or other factors. Adults might also require orthodontic treatment in preparation for advanced dental treatment, such as crowns, bridges, or dental implants. Orthodontic appliances are sometimes used to treat snoring and sleep apnoea using an appliance that can be worn at night to keep the airways open. How Much Will Adult Orthodontics Cost? Under-18s are eligible for free orthodontist consultation. Most dentists do not offer NHS orthodontic treatment to adults, although if the need for treatment is very severe the NHS may fund it at the same rate as other major dental work. Overall it is more common for adults to pay privately for their orthodontic work. The cost depends upon the individual problem to be treated, and to an extent on the appliance(s) chosen. As for all dental work, the success of the process critically depends on patients looking after their teeth and any appliances as directed by their dentist and getting regular dental check ups.